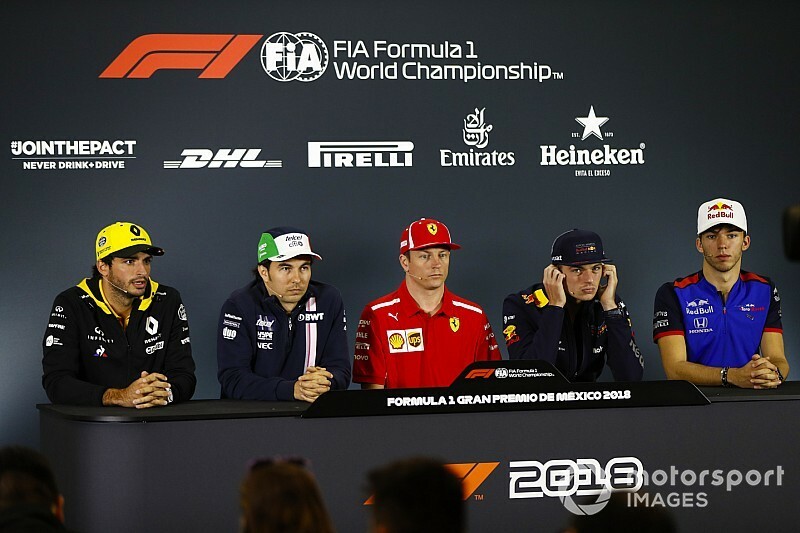 DRIVERS – Sergio PÉREZ (Racing Point Force India), Carlos SAINZ (Renault), Kimi RÄIKKÖNEN (Ferrari), Pierre GASLY (Toro Rosso), Max VERSTAPPEN (Red Bull Racing). Sergio, it’s your home race this weekend? Sergio PÉREZ: It’s amazing. Since the first year we’ve had the Mexican Grand Prix it’s been big. We’ve seen in other countries that sometimes it backs away, but it doesn’t happen. Here the people, the media, everyone is so excited about this weekend. It’s been great, you know. The amount of support that I’ve received during the weekend is amazing and I think, once again, we’re going to have an amazing grand prix. Q: You’ve finished in the points every year since the race returned. How confident are you of a repeat this weekend? SP: That’s the minimum target, you know, to score the points here, but I hope that this weekend I do my best result through them. I think we should be string. We should be fighting to be best of the rest. Renault was very strong last weekend but I think we should be there and hopefully we score a lot of points for the team. Q: Pierre, if we could come to you please. Looking back at Austin last weekend, you ran some aerodynamic upgrades on the car, then took them off just before qualifying. Are you going to be using them here, what can you tell us about that? Pierre GASLY: Yeah, in Austin it wasn’t ideal with the weather conditions, so we a new package that we could not run until P3 and yeah, basically, we need more mileage, more running with this one to really understand how to use the package and extract the full potential, so we took it off before the qualifying. This weekend we are going to run it again. We’ve got only one part, so this time Brendan is going to get it on the car and hopefully we can learn a bit more about how to use it. Q: Looking ahead to 2019, it’s very clear what Red Bull Racing are going to get as far as you’re concerned but what about Honda, especially in light of recent upgrades they have introduced? PG: I think things look really promising. They are working really hard. We saw in Suzuka, we went to all the factories and you can see the dedication and commitment from the people. There is a big opportunity ahead of Honda. They’re going to be in a relationship with Red Bull. They have been struggling in the last few years but next year we are going to be in a position to fight for the top positions. They really want to make the best out of this situation. I think the progress they’ve made over the last few weeks with that new spec is really encouraging and they are still working on next year’s engine, trying to extract even more performance. For sure we need to give them time, for sure it’s super difficult to catch up with Mercedes and Ferrari but slowly they are catching up and I’m really confident they will keep improving and I’m really excited to see what they can do ahead of next year. Q: Thank you. Carlos, let’s start by looking back at Austin last weekend. It was Renault’s biggest single-race score of the season. Was that track specific or are you confident that you can repeat that this weekend here in Mexico? Carlos SAINZ: Let’s say that after some three or four races the team decided to do a bit of a rethink on how we approach weekends and how we can maybe score some better results and Austin was a great example of a good team effort but at the same time a track that was suiting us better – a lot more low-speed corner that our car works well on; a bit less power sensitive, that obviously in qualifying we feel it, so a combination of hard work but also a track that was suiting us better made us score a very strong result, which we needed for that fourth place in the championship. I think Mexico is another great opportunity to score a double points finish. It’s still less power sensitive; it’s quite a lot of low-speed corners, so it could present some good opportunities, but we need to stay as focused and as determined as we were in Austin for sure. Q: Let’s throw it forward to 2019. How are you preparations with McLaren coming along? Have you had any contact, or does that not happen until January 1st? CS: Of course there has been some contact. There has been some organisation of how to plan the winter, but nothing to do with performance or… engineering talking, let’s put it like that. I think I’m fully committed to this project, to the Renault, until the end of the year – until, really, Sunday afternoon after Abu Dhabi – and I think my results in the second half of the season are proving it. We are scoring a lot of points, I think it’s 17 points since Hungary, and finally my season is starting to come together. I’m very pleased, very happy with how things are going here and I really want to finish my season with Renault, my time with Renault, on a high, like we are doing now. Q: Thank you Carlos. Max, I’d also like to look at Austin with you. Tremendous race by you; 18th to second. We saw you overtake more cars than any other race you’ve done. How do you reflect on last weekend? Was it one of the best races of your career? Max VERSTAPPEN: It was definitely a good one but it’s difficult to choose if it’s going to be the best. I also don’t want to really look at it like that. It’s always important to try to score the most points as possible, especially when you start at the back. I think we didn’t expect to really fight for the podium but looking at the year before as well, we were really competitive in the race and again it showed this time out as well. Doing the opposite strategy I think seemed to be working well and to be at the end of the race fighting for victory was very nice. And of course to hang on to second in the last few laps was challenging with the tyres I had, but also a lot of fun. Q: Well you won this grand prix last year and the RB14 is clearly performing well. Of the three remaining races this season, do you think this is your best chance of another victory? MV: This is definitely the best chance for us. We’ll try to set up the car in the best way possible and we’ll find out how we’re going to perform. I don’t think in qualifying we have a chance but in the race we anyway seem to be working a lot better, so I expect this to be better than Austin. Q: Thank you Max. Kimi, thank you for waiting. Great to see you back on the top step of the podium last weekend in Austin. Can you just tell us with the benefit of hindsight how much you enjoyed that race and everything that came after – and did you send a cap home for Robin? Kimi RÄIKKÖNEN: No, it’s for the wife but I’ll bring it with me after this race. It was a great result obviously and a good race and we had to fight for it quite a bit, so I think it didn’t come easy. But I think it’s good for us and good for everybody. I think it was an exciting race. What else to say? We were happy. Hopefully this weekend we will be strong. The end result we’ll see on Sunday, but we’ll do our best. Q: This has been your best season since rejoining Ferrari in 2014. It’s also your last season with Ferrari, so how will you reflect on 2018? KR: I don’t know. Obviously we’ve gone through it and I don’t see much point to look afterwards at what we did. It’s not going to change anything and we’ll see where we finish. It’s not what we want in the end result, but we did our best and we’ll finish maybe third, maybe fourth, maybe somewhere behind that. It's not ideal. But it could be worse. Q: (Fernando Alonso – Motorlat) It's a question to everyone. How do you think about the relationship between the experience and the young? Because here we have this mix of drivers, with Kimi like the most experienced, and Pierre like the rookie. But all of you have an opinion and how is the age working for your growing in the results you have with your team. What are your thoughts about that? Q: Well, Kimi, you recently turned 39 and you’ve just won a grand prix, so how is age helping you? KR: I don’t know if it’s helping or harming but it seems to be working still OK. I guess a certain amount of experience helps, that’s for sure. But I think in this sport it’s not probably that necessary to have a massive amount, because you can do a lot of things on simulators. We are doing basically the same tracks. If it’s 5 kilometres, or four, or whatever it is, we are all going to learn it. It’s not like 10 million miles will help more than the shorter distances. In rally it helps a lot more, the experience, but I think for me it’s helpful. I feel better, for sure, than when I started, in the first year. But I guess there is a certain points when it doesn’t make such a big difference anymore. Q: Max, you’ve achieved a lot at a very young age. How difficult was it for you when you first came into Formula 1? MV: Well, for me, I think it’s still the more experience I get, the faster I’ll become, so I haven’t stopped learning. PG: I think, for sure, age is probably not that important – maturity is the main thing. For sure, the experience is useful. I’m only in my first complete season and I don’t know how I’m going to be after five years, but I can feel already the difference now, compared to a year ago when I came in Malaysia for my first race, so you just get more confidence, you know how things work. Probably after four or five years things become a bit more automatic. I’ll see that in the future. SP: I think experience helps in how you can direct a team, how you can build it around you, how much progress you can make with your car, with the set-up. I think experience really helps and makes a difference. I think it’s definitely a good bonus. As Kimi said as well, you get to a point where nothing really changes. Your speed and a bit of experience always helps as well. CS: Yeah, I agree with Checo there, that experience helps you a lot to get to know yourself, how to extract the maximum potential of yourself, within a team and within a car, within a set-up. With more experience, the faster you get, as Max said. But at the same time it gives me a lot of tranquility to see that a guy that is 39 years old can win in Formula 1. There’s a lot of time ahead for many of us and seeing Kimi winning last weekend also showed that Formula 1 is one of those sports where you can be successful at a later age. Q: (Lawrence Barretto – F1.com) Kimi, can you just talk us through the 24 hours after your victory? How did you celebrate? What did you say to your family and to your little boy when you had a chance to talk to him? KR: They were very happy when we talked. We had a small party. It takes a long time to recover these days, so that part is definitely not the nice part – but the first part is always fun. Not really much, just a few friends and that’s about it. Q: (Janne Palomaki – Iltalehti) Kimi, your victory last Sunday was received in Finland with overwhelming joy and collective euphoria. Even some political leaders joined in congratulating you. How did it make you feel – and were there any especially surprising congratulations for you? KR: I haven’t really looked that much on the news so obviously I don’t know who has. I’m happy if people are happy. The main thing is that I feel good, what I’m doing. The rest, some nice, some not, and that’s absolutely fine. Yeah, I think obviously it’s great. I don’t think we always have the biggest support from Finland. So, I don’t know, when we get it, we’ll take it – but, like I said, I don’t know exactly if somebody congratulated. Not many people have my number so it’s not going to be that direct. Like I said, I don’t read too much stuff on the ‘net, so… I’m more than happy and will take all the good wishes on board. We go forward and see what we can do. Q: (Jim Vertuno – AP) Checo, Formula One is back in Latin America. You’ve been the only Latin American driver now on the grid for a couple of seasons and it’s been a long time since there’s been a champion. What do you see as the future for Latin American drivers in F1? Is there one – and what sort of obstacles do you think they face right now? SP: Well, I think being in Formula One for whatever nationality or any driver is very hard, y’know? To reach Formula One and to maintain in Formula One is very hard. As you say, it’s only me at the moment and it’s just hard. I see some others coming through, through the series but the journey to reach Formula One is very hard – especially for the Latin Americans. Because we are the ones that have to go to Europe at a very young age, sacrifice a lot more than the European drivers, in a way. It’s very hard – but there are some coming through. We’ll see whether they reach it or not – but it’s just how Formula One is. It’s very hard to reach it. Q: (Rik Spekenbrink – AD Sportswereld) Question for Max Verstappen. You return here as the last winner. You were in that situation only once in Spain last year. Does it change something in your approach, in self-confidence, in your love for a circuit – or is it just business as usual. Q: (Alfredo Lopez Ledesma - MomentoGP) My question is for Max. Christian Horner told yesterday that the Honda engines was 0.6 faster than the Renault unit at Austin. Do you really think that Red Bull-Honda will be a real challenge for the championship next year? 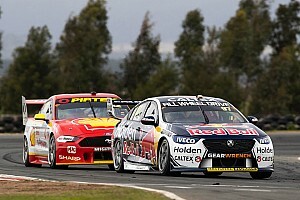 MV: It is, of course, difficult to say, because we still need to develop a very strong car. So, we’ll find out next year. I think initially we may be not strong enough to really fight for a victory but I think throughout the season we’ll definitely catch up. That’s how we’re planning. So hopefully it will work out like that. Q: (Carlos Alberto Velazquez – Reforma) Question for Kimi. In the last three races here in Mexico there has been three different winners. It’s time to you and Ferrari to win. Do you feel that this weekend as confident as in Austin to make all the Ferrari Mexican fans happy this weekend? KR: For sure as a team we’ll give our best – but we cannot guarantee anything. Right now we’ll work as normal from Friday to Sunday and then at the end of the race we’ll see what we get out from it. But we’ll do our maximum and hopefully we’ll be up there fighting for the victory. Q: (Dieter Rencken – Racing Lines, Racefans.net) Sergio, over the five years that you’ve been at Force India, you’ve been able to establish yourself as a major player for the team, both through results and although through your commercial partners etc., But for next year, your team-mate is highly likely to be the son of the team owner. How do you think that will affect the team dynamic? SP: I don’t think it will change. At the end of the day, the interests of all the team, even the team buyer, the team owner is that the team is very successful. So, for that you need both cars to be at 100 per cent and for the team to develop as quickly as possible. So, for that you really need full performance. So, I think if that happens, he’s coming in to a great team with great people, engineers, where he’s going to grow a lot. I see great things for the team. I think we have all the guidance, we just need the budget and I think we can be a massive surprise next year. Q: (Phil Duncan – PA) To all the drivers, except Kimi. Do you think you would have won the Championship if you had been driving for Ferrari this year? MV: I’m not driving for Ferrari so I’d prefer not to comment. PG: Similar. It’s difficult to say something about a car you’ve never tried – but probably with my experience it would have been difficult. SP: Very, very hard to know. Certainly I would have been a lot closer! CS: Impossible to say. Nothing. I don’t know. If I try the car I’ll let you know. Impossible to say. Q: (Louis Dekker – NOS) Max and Kimi, do you think this circuit is a true Mercedes circuit or can all three teams fight for victory? And does it make your life easier that Lewis doesn’t need a win? KR: I think that if you look at the past years, all three teams being up there, and then it really depends on the small things whoever came out on top. It’s impossible… it’s pointless to start guessing right now who’s going to be up there, or if one team is going to be better than another. We don’t know. If we look at previous races it can go either way. I don’t know if it’s going to be any easier if he only needs three points to get the championship but who knows? MV: I don’t know. It will be close between them in qualifying and I think we will be a little bit behind but in the race we definitely have a chance, I think. And about Lewis, I think as a driver you always want to win so I don’t think that changes a lot. Q: (Scott Mitchell – Autosport) Carlos, Kimi and Pierre: you guys are all switching teams for next season. The Abu Dhabi test, after the race, is an opportunity to get first experience of that new team. Have you thought about driving for your new team in Abu Dhabi and do you believe that that will happen? CS: Yeah, as you said, it’s a good opportunity to try this year’s car – obviously not next year’s car which is not the same. I’m focussing on these three races. I think my management and company are looking into whether it’s possible or not but at the moment it’s not decided yet or nothing has been clarified. Q: Kimi, any decisions about you and Sauber? KR: We’ll see. I think we’re quite open to any decisions. PG: At the moment it’s not really decided so we’ll see what happens in the next four weeks but it will be a good opportunity to start working with the team ahead of next year. Q: (Jaap de Groot - De Telegraaf) Max, could you tell us what the positive and negative effects are of racing at altitude, technical and physical? MV: I think the engines will be a little bit closer because it’s just a bit more difficult for them to breath. Downforce-wise you lose a lot of performance and then it’s more about mechanical grip and stuff because even with the biggest wing here you have less downforce than in Monza and I think our car is very good mechanically, anyway, also aerodynamically. Of course, that’s less of a factor so that’s why I think we are normally more competitive on this track than others, even though there is a super long straight in the track, so I think that just explains a lot. Physically it’s not a big deal because it’s so low grip. Q: (Francisco Alcalà – Global Com Group) What are your thoughts about Fernando Alonso leaving this season and will you miss him at the end of it? PG: Of course. Fernando is a legend of Formula One. I used to watch him before I even started karting, when I was eight years old. For me he’s always been a guy I’ve looked at when I was young. He’s been on top. He won championships with a French team and I remember he was big news, all over the magazines back in France. He’s a fantastic driver, for sure it’s a shame to lose a character like him but he probably has other challenges ahead of him and I’m sure we will keep hearing great things about his future. MV: Yeah, I think Fernando is a winner and he wants to win races so he didn’t see that happening in the near future and of course he has already tried for a few years so I think I can understand why he’s leaving. Probably some new advantage where he can probably win again. I think that will motivate him very much and then we will see what happens in the future, if he comes back or not. KR: We have had some good battles over the years. It’s how it is, unfortunately, and the fact is that we’re all going to stop at some point. We always know that’s coming and us older ones have to go at some point. That’s how it goes and I’m sure he will find some exciting racing for him and who knows what happens in the future. SP: Yeah, as Kimi says, at some point we are all going to stop so I think for Fernando the time came. He’s had a tremendous career, he’s a tremendous character, a great guy, one of the guys I get on with so we will definitely miss him but you never know, maybe he comes back in the future, maybe he doesn’t but he’s definitely one of the legends of the sport. CS: The fact that he’s leaving I think is a big loss for Formula One, to not have one of the best drivers or the best driver in motor sport on the grid at the moment is a big loss so I think it is something for Formula One and everyone to consider why one of the best drivers is leaving and why we cannot have a bit more competitive grid where many drivers can fight for wins or for podiums. I think it’s a thing to consider and something to think about for the future. Q: How much of an influence did he have on you becoming a Formula One driver? CS: Obviously the biggest influence on anyone. I followed Formula One, I met him back in 2005, I also remember meeting Kimi back then. Since then, I really decided that I wanted to become a Formula One driver and gave it all to get here. I managed to compete against him for the last four years which have been a dream come true and of course we will miss him. Q: (Ben Hunt – The Sun) To all drivers, although Kimi, you might chose not to answer it: are you a bit surprised by the mistakes that Sebastian Vettel has made this year and do you think that he has thrown this championship away, given the commanding lead he had at the early stages of the season? CS: Well, I think it’s always difficult to judge the performance of any other driver and car because you don’t know what they are going through. Of course, there have been some mistakes that we’ve all seen but I think it’s very easy to judge it from the outside and not know what is clearly going on in there. I really respect Sebastian, I think he’s a four time World Champion for a meaning (reason) because he deserves to be a four time World Champion and he will come back eventually. I think he might have gone through a tough moment but I think he will be back. SP: Yeah, similar to Carlos. I think Sebastian is a fantastic driver. It’s very hard to judge the performance of someone when you’re not in the team and you don’t know exactly what’s going on. So it makes no sense for me to say. Obviously we have seen some mistakes. Probably at the end he was just desperate, trying to achieve what was probably not possible but he’s a four time World Champion for that reason so he has a great team and he will be back to fight again and he has a great opportunity to fight Lewis. Mercedes also have a fantastic car so it was very hard for him. KR: Well the first thing is that sometimes it happens and he pushes and pushes and sometimes he gets it wrong and unfortunately it happened to him a few times. I think we’ve all gone through it, it’s part of the game. MV: I can only look at myself. I think it makes no sense to comment on another driver so I don’t want to piss anyone off. PG: I think it’s part of racing. You’re always driving at the limit. I think he probably over-performed with the car he had at the beginning of the season. A couple of times he managed to win races which probably they probably didn’t have the potential to win and then of course, expectations were really high. He did a couple of mistakes in the second part of the season. I think he’s the only one who could answer why. When you’re fighting for the championship, you’re so much on the limit all the time, trying to achieve things, as Sergio said, was probably not achievable with the car he had a couple of times and then things happen. They all say he’s a four time World Champion, I think he knows how to manage a championship. It’s not the first time he’s in this position but he’s the only one who could answer that question.